With The Success Of Our Uls Line System And The Extended Use Of The Concept, We Saw The Potential For Developing Some Specialized Rod Models, Based On Test Results From Use With Uls 3D+ And Multi Tip Lines. Guideline Has Been Asked To Develop Some Ultralight, Small Double Hand Rods For Quite Some Time Now. We Decided To Build These With A Variation Of Our Switch Handles To Match The Shorter Rod Length. When Test-Fishing Them, We Found That They Perform Absolutely Fantastic As Single Hand Rods And With This Customized Grip Design, We Felt It Was Only Natural To Name These Rods Uls Hybrid , As They Sure Are Something Right In Between A Switch- And A Single Handed Rod. The Intended Use Of These Rods Is River Fishing For Trout, Sea Trout, Salmon And Steelhead. However Guideline Has Found Them To Be Very Capable And A Joy To Use Also From The Bank Of A Lake Or While Boat Fishing For Pike, Perch And Rainbows. These Rods Are Very Easy To Use When Single Hand Spey Casting! The Deep, Yet Powerful Action Make These Rods Very Tolerant Against Casting "Errors" In The Anchoring Phase And The Longer Stroke Give The Caster More Time Planning The Cast, When The Leader Hits The Water. You Easily Connect With The Bottom Part Of The Rod And The Typical Catapult Effect Will Come With Very Little Use Of Force. Effortless Casting And Easy Good Distances Are Typical Keywords. If You Are Targeting Larger Trout And Grayling Or Migratory Fish On Medium Sized Tree-Lined Rivers Where The Use Of Even Longer Rods And Lines Is Very Limited, These Rods Tick All The Boxes. Guideline Has Used High Strain, Low-Resin Content Material To Achieve Extremely Light And Thin Blank Profiles. The Flex Is Deep, Yet Fast And Lends Itself Perfectly For Use With Our Uls Lines, But Will Also Work Superb With Ultra Compact Heads And Wf Lines With Short Heads Like Our Bullet Or Fario Wf Lines. Satin Matte Black Reel Seat. Non-Tangle Style Stripper Guides And Single Leg Black Running Guides. Black Colored Blank In Satin Matte Finish. Matching Dark Grey Wrappings With Metallic Green Trims. 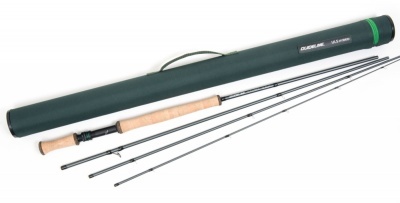 Delivered With Rod Bag And A Lightweight Rod Tube In Matching Color.